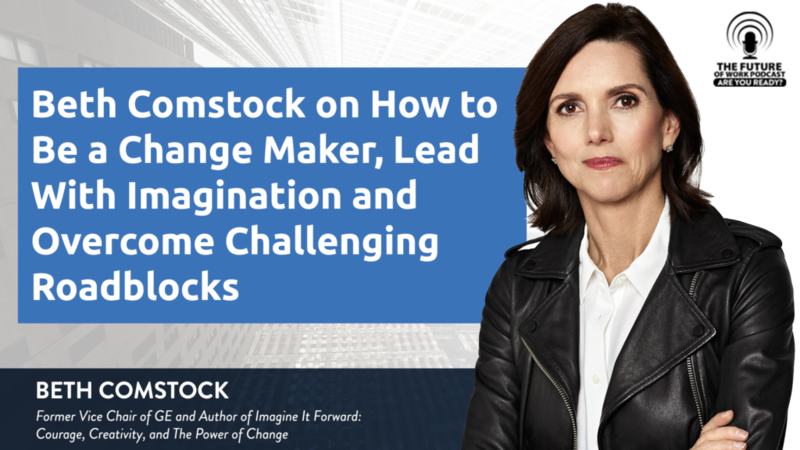 Beth Comstock, is the former CMO and Vice Chair at GE and the author of a new book, Imagine It Forward: Courage, Creativity, and The Power of Change. The book pulls from Beth’s experiences and observations from her 20+ years at organizations like NBC and GE and it is about summoning courage and creativity in the face of change. For nearly three decades at GE, she led efforts to accelerate new growth and innovation, initiated GE’s digital and clean-energy transformation, started new businesses and enhanced GE’s brand value and inventive culture. As President of Integrated Media at NBCUniversal, Beth oversaw TV ad revenue and new digital efforts, including the early development of hulu.com. She graduated from the College of William and Mary with a degree in biology. 2. Discovery – We have to use the world as a classroom for discovery. Get out in the world and look for patterns and make connections. It is important to break up your patterns; take a different route to work, for example. 4. Story craft – “Story is everything.” If you are a leader you need to start with the story. People don’t want to follow numbers; they want to follow a story, a passion. Beth has also had to learn how to handle being told ‘no’. She talks about a time when she was working at NBC where she pitched an idea to the president and was told ‘no’. Most people would have given up after the first ‘no’, but Beth believes that, “no is not yet”. She did not give up on that idea she pitched. She went back to the drawing board, tweaked it and kept re-pitching it to the president. Even though he said ‘no’ a few more times, she never gave up. She didn’t take no as a final answer, no just meant that it was not quite there yet. She finally got a yes and that idea turned into the NBC Experience Store.